Hi friends! I’ve been super busy lately with packing up to move to a temporary home while my family waits for our permanent residency to be vacant. On top of that, these 37 weeks of pregnancy are starting to take a toll. Whoa, baby! Today I’ve created a set of free labor and birth Bible verse printables for myself that I thought you might like too! 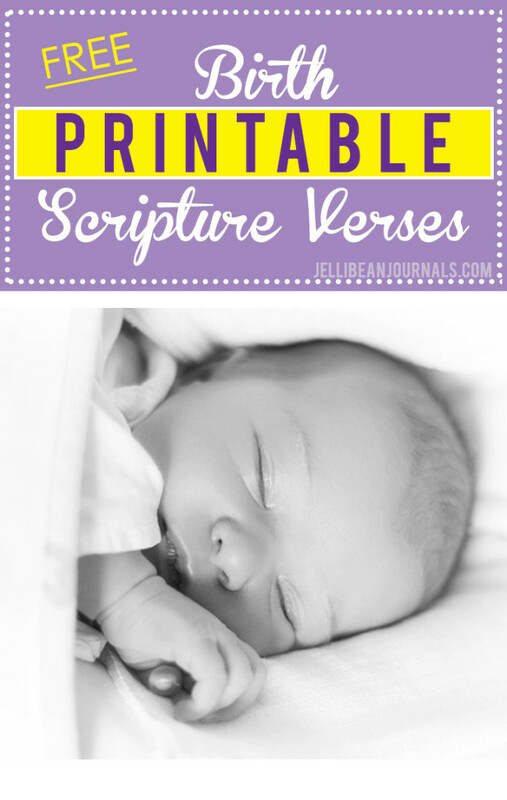 This kind of labor and birth Bible verse printable cards is something I ALWAYS use to focus during birth. I cannot tell you y daughter’s homebirth I sat at the kitchen table rocking back and forth for hours pouring over some of these verses. Likewise, with my son’s public hospital birth here in Costa Rica, though the nurse made me shed my eyeglasses when I stripped down to don their birthing apparel, I clenched my verse cards tightly, holding them up to my nose to read the print. This set of eight birth Scripture printables isn’t fancy. It doesn’t have cute photos of newborns or little birdie designs. When you’re in labor, you don’t care about those embellishments, you care about the text. I’ve created these pocket-sized birth Bible verse printable cards in shades of lavender, the most calming, soothing color on a pale grid card pattern. Print out the PDF, trim them, and laminate, if that’s your style. I like to keep them on a ring so I can flip through them at will. I hope you find these Bible verses for birth to be helpful in maintaining your eyes on our Creator as you work alongside Him to bring new life into this world. Sign up for my weekly newsletter to snag more free printables and subscriber-only freebies today! As an adoptive mom, my labor and delivery was super easy. We just had to drive to the hopsital, but these are great verses for us all to have handy! Haha, you’re right, Jennifer, but I’m sure that you and your husband sent MANY prayers up to heaven before you ever met those sweet children He gave you. Have a beautiful week. What an awesome idea. I would have never thought of that – then again, I’m still far off from the parenting season of my life. 🙂 Blessings to you my friend. Thanks so much for the compliments on my blog design. It took me years to create a design I was happy with (and thankfully have been for about a year- a record!) 🙂 Hope you have a great week, Sam. Thank you for taking time out of your day to stop by. These are awesome for those of us not giving birth and having labor. These are great daily encouragements. Daily pick me ups for others. praying for you and your family as you continue to serve the Lord and as you get ready to deliver the baby. You have a great list for others who are starting on this journey. So glad you are sharing them! Nice post, Jelli. I don’t know anyone about to give birth but I do think your idea of birth Bible verse cards would be a great tool for any woman about to go through the process of bringing a new life in the world. Having the Lord by your side while giving birth is a must! These are awesome! And I can’t believe you’re so busy at 37 weeks! I hope everything goes great! And I am definitely saving these! Thank you so much! I am not currently pregnant but I wanted something like this when I was. We do hope to have more children later (my daughter is 1 right now) so I am bookmarking this for later. Thanks so much, Pamela, for taking a moment to stop by today! Hope you have a fabulous week and do find the Scripture printables helpful next time you’re pregnant.